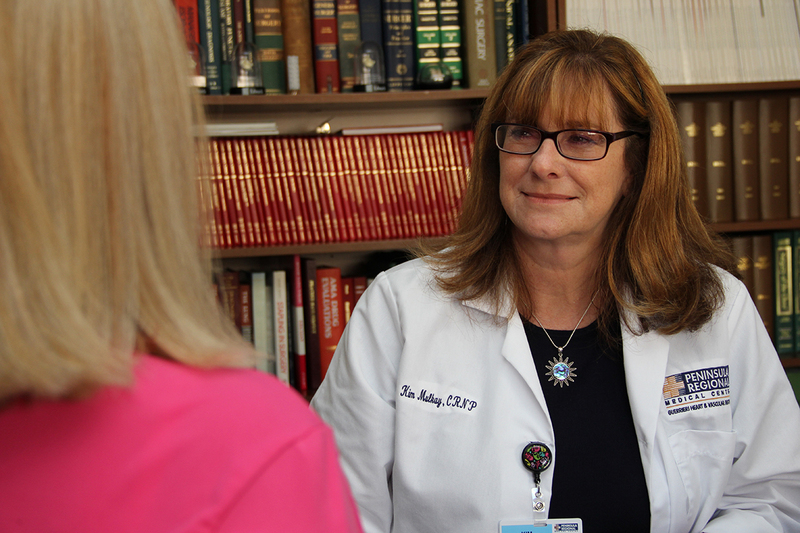 Kim Mulkay, CRNP, consults a patient at Peninsula Regional CV Surgical. An arrhythmia is an abnormal or irregular heart rhythm caused by disturbances in the heart's electrical system that controls the rate and rhythm of your heartbeats. Common conditions that are considered arrhythmias are tachycardia, a fast or rapid heartbeat, and bradycardia, when the heartbeat is too slow. Peninsula Regional Medical Center’s Guerrieri Heart & Vascular Institute uses imaging tools, ablation strategies and devices to manage heart rhythm disorders. We offer the only comprehensive electrophysiology (EP) program in the region, with a broad scope of diagnostic and therapeutic procedures including cryoablation for atrial fibrillation (A-Fib), implantable cardioverter defibrillators (ICDs), implanted event monitors and pacemaker implants and devices for patients with heart failure. New to the Guerrieri Heart & Vascular and in cooperation with Peninsula Regional CV Surgical is the Atrial Fibrillation Surgical Management Clinic. This clinic evaluates patients with atrial fibrillation for interventional procedures to manage risks related to anti-coagulation therapy or for patients who cannot take anti-coagulation therapy, or blood thinners. The newest procedure is the left atrial appendage closure device which is called the Watchman Device, a small, parachute-shaped, self-expanding device designed to close the left atrial appendage and reduce the risk of stroke in patients with A-Fib. The Guerrieri Heart & Vascular Institute features two dedicated EP labs and offers state-of-the-art treatment options. If you have a heart arrhythmia, ask your physician to refer you to one of the cardiology practices in Salisbury; the cardiologists and electrophysiologists can then decide the best treatment options for you in managing your arrhythmia.